We are a leading manufacturer and supplier of Shoe Labels. A comprehensive range of flexible solutions to meet your operational and compliance requirements for care labels, price tickets and stickers. Our company has gained immense accolades in the field for providing Footwear Label to the clients. This product is used to enhance the looks of Footwears. This product is designed by using high grade of rubber sourced from leading vendors of market. This product is very attractive in designs and colors. We provide a wide range of Shoe Labels to our reputed clients at reasonable prices backed by our rich industry experience. 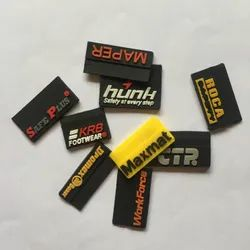 Our rich industry experience in this field enabled us to provide a wide range of Silicone Shoe Labels to our reputed clients at reasonable prices. Our valuable customers can avail from us an attractive assortment of Shoes Labels within the stipulated frame of time. These products are made from high quality components. Having a definite quality management system, we are readily engrossed in bringing forth a comprehensive gamut of Shoes Label Stickers.